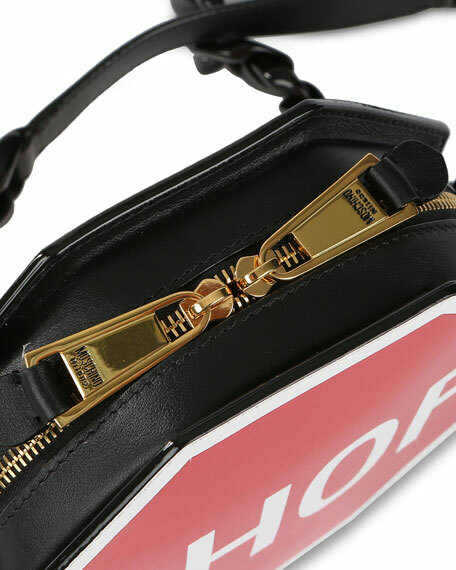 Moschino inlaid leather shoulder bag. 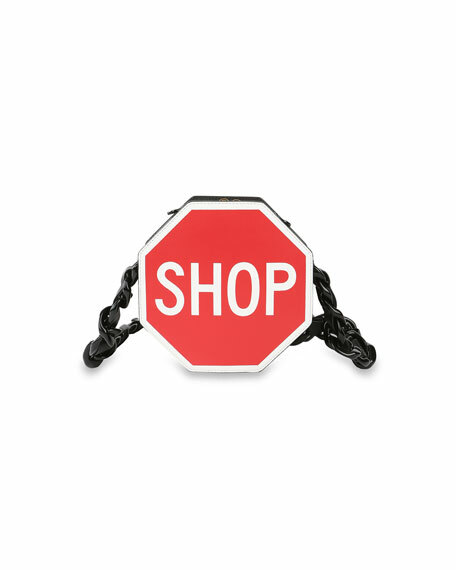 Stop sign shaped body with "SHOP" block lettering. Covered chain strap; 17" drop. Approx. 7.9"H x 7.9"W x 2.4"D.
With impeccable tailoring and exquisite design, Franco Moschino made a statement in fashion since the beginning of his namesake line in 1983. Blending his wit-filled humor into apparel gave the fashion set a new perspective on expressing themselves through clothes. Collaborating with Rosella Jardini, the two created ready-to-wear apparel for women, men, and children renowned by all. From playfully designed dresses to standout accessories, Moschino embodies tongue-in-cheek fashion infused with enviable artistic craftsmanship. For in-store inquiries, use sku #1607354.